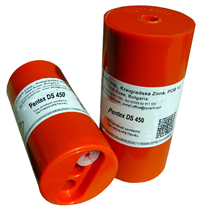 The Pentex™ DS 450/DT 450 boosters have a plastic cylindrical shell with central longitudinal tunnel. The top of the booster is tightly closed with a plastic cover with a central hole. On the bottom, around the central hole, the booster has one or two detonator pockets. The booster packaging protects the energetic mixture from static electricity and the environment erosive action (water, air). The boosters are designed for picking up and amplifying the initiating impulse and subsequent initiation of high-order detonation in low sensitivity commercial explosives (Anfo, slurries, emulsions) used in mining, quarrying & construction, where no risk of explosion from ignition of gas or dust exist.